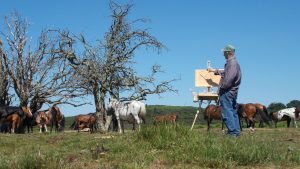 Barry Peckham HSEA ROI RSMA offers an opportunity to paint with him out in the New Forest he will be on hand to offer advice if wanted. Please meet up at the venue for our morning paint session. Springmoor Farm, Pound Lane , Burley, Hampshire.BH24 4EF for a 10am start so please arrive a little earlier to get set up. Please note that attendance at the morning session is at the artists own risk. 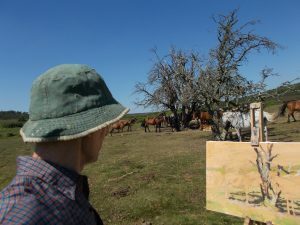 Paint from heavy horses held in yard at Springmoor Farm from 10 am – 1 pm. Lunch in local pub or please bring own packed lunch 1pm – 2pm. A donation of £10 for the morning session would be very much appreciated, the venue hosts are not charging for the facilities but would like to make a donation to their local scout group so all proceeds will go to a good cause. Cash will be collected on the day. Please be aware that participation of the morning session and whilst out on the forest is at your own risk though every care will be taken.